Oh man it rained last night. A steady rain almost the whole night. It wasn’t a sideways rain, so I figured I was fine. 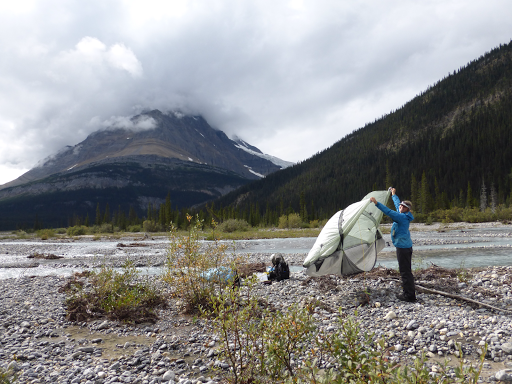 I woke up at 12:15am to find that my tent, which had been used well over 200 nights may be showing its age…the water had saturated the one walled tent and was slowly seeping through the wall and running down to the edges. All good because it is designed to drip out the mesh that hangs outside the bathtub. Problem is that my mesh and bathtub were so saturated that a small puddle had formed in a corner near my head…and the down jacket I was using as a pillow was partially in the puddle! The hood and one sleeve were completely soaked to the point of being wrung out. It was not warm out and I would need that down jacket. Not good. By the time I dealt with that and the puddle, I had to go out in the cold rain to pee. Then I was awake and did some blogging from 1am-2am. Then I finally slept for awhile and woke up at 5:30am with still steady cold rain. I got up and walked the 100yds in still steady rain with my umbrella to E’s tent (and our food in bear boxes) and we discussed our options. We decided to just get up and go despite the rain since it was supposed to rain all day anyway. 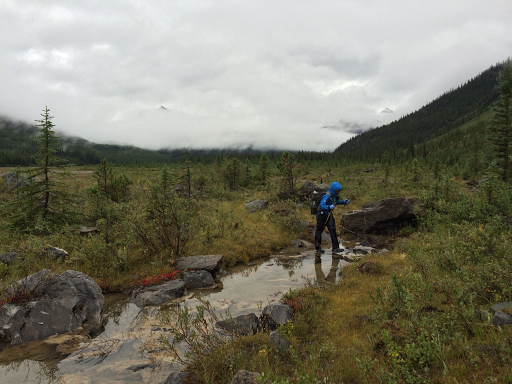 We’ve been cold and wet a lot in brush and had a decent amount of rain, but this was the first morning we packed up and started hiking while it was raining. That took some motivation. 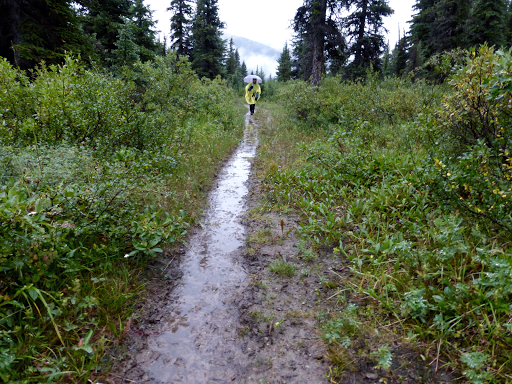 The early morning hiking was mostly through muddy forested or meadow trail. Fortunately, it stopped raining about an hour after we started hiking. Unfortunately, it was quite brushy, so it didn’t really matter and we were soaked by cold wet brush anyway. It wasn’t freezing cold, but it was just cold enough to be uncomfortable, and for me, quite chilled all day. All we needed was a bit of sun. I just couldn’t get warm. In the distance, the clouds were attempting to lift. It wasn’t my day and I ended up falling five times. I’ve done pretty well all trip, but I think the combo of being tired and carrying a heavy load, now 8 days of food, just threw me off. 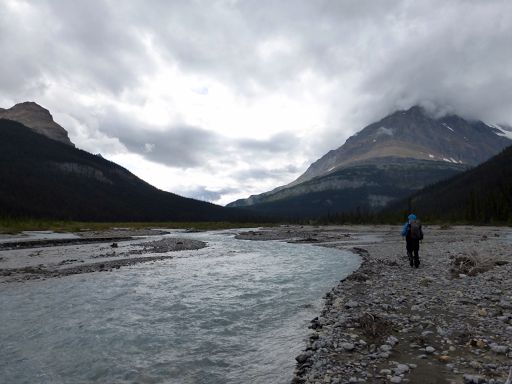 Twice I fell hard in shallow water slipping on a log or rock and that really didn’t help with my being so cold and wet. 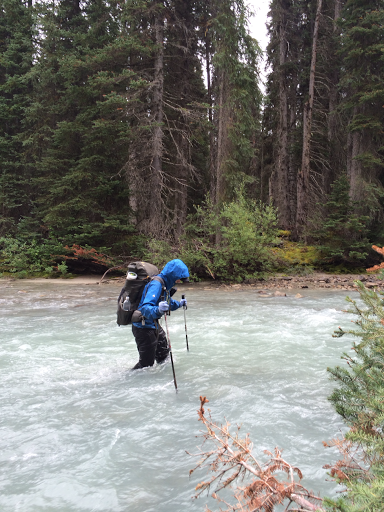 Even with the rain gear, it was soaked through in many places like my pants and arms. Brrr! 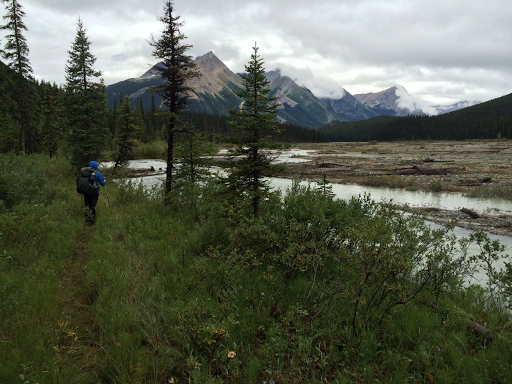 We joined Jasper Park’s N Boundary Trail for the morning and it was still quite overgrown and brushy. 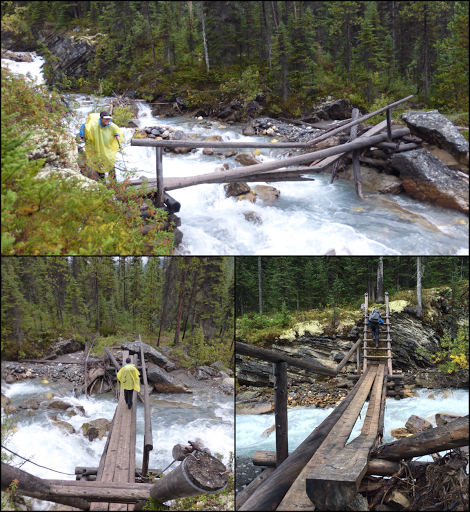 We had some crossings over some broken, but still functional bridges. We had many small fords and the biggest one was Carcajou Creek, which was swift, but we were able to find something more shallow downstream. If I look cold, it’s because I was! 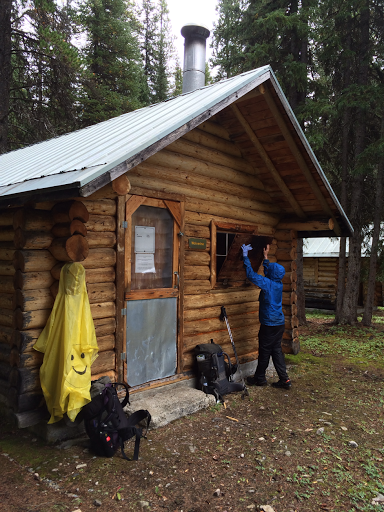 We ate lunch at a closed warden cabin, but stopped there hoping it would have someone there or just somewhere to sit that wasn’t wet. Well, we did sit on a little concrete step in the front, but the sun still didn’t come out and I was too cold to enjoy the break. I even did jumping jacks to try to stay warm. It was about 45F/7.2C most of the day. Not a fun temperature to be wet in with no hope of drying out. We did try to dry out tents at lunch with no sun and no luck. We both also had wet sleeping bags from all that moisture and really needed to dry them out. 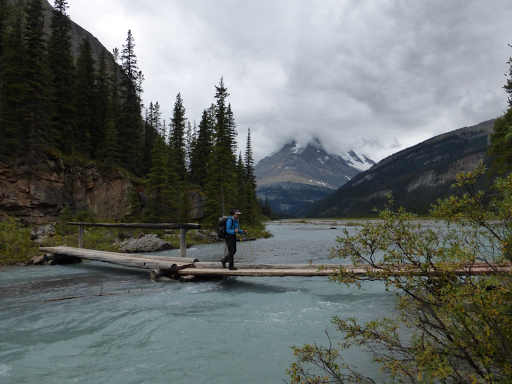 After lunch, we crossed Chown Creek Bridge and came out onto a gravel flood plain of Chown Creek. We had some cross country to do for about an hour just finding the best path to get across it and we had many small fords to do with how wide it was. Then, at the end of the day, around 5pm, we saw blue sky trying to break through! We knew this was our one shot to dry things out, so we stopped in the middle of the flood plain and laid everything out to dry in the little bit of filtered sunlight we got. After that, we found the trail and went back into the forest for a moderately steep and brushy hike up to Bess Pass. Just as we were ending the day, I had my shoe (which has a big hole on top of the toe box) get caught on an exposed root end. My pack weight had the momentum and I fell forward petty hard hitting my kneecap, ugh. The fifth fall and the most painful. Just a bit after that, we got to our final destination of Bess Pass. 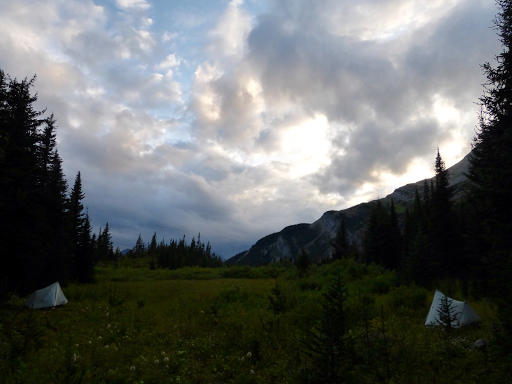 It was not the most amazing spot to camp with tall wet grass, but it was an old site marked in our guidebook. We knew it was the best option within the area and it was 6:45pm, so we took it. To the right in the photo is a large wall of mountains. The sun even came out for a bit and we were able to dry things out more. It took awhile to find a good spot to hang and that’s always frustrating. We have so much food this leg that we each have two bags to hang, so we each will hang our own for the first half of this leg. I am wiped out and very happy to be somewhat warm in a mostly dry sleeping bag. It has started to rain again, so all this tall grass will be nice and wet first thing tomorrow morning. Of course!